This is the final week of June and the beginning of July. 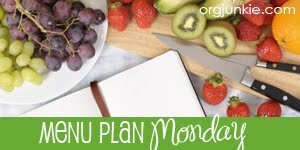 Our July is going to be super busy as you'll see with our monthly meal plan. It will post on July 1. In the mean time, we're going to finish up June meals. We'll be sharing our version and verdict of the Club Burgers with Avocado Ranch Dressing on the following Monday. I think that's it for the week. Hope you have a tasty week! Your menu looks really good. The peach oatmeal and oven cheese fries really caught my eye. Now how come I never thought of putting cheese on my baked potato wedges? I'll have to try it soon. As for the peach oatmeal, do you use fresh peaches or peach preserves? April - I'm finishing up some boxes of Quaker Instant oatmeal I got for pennies a few months ago. But for next month's OAMC day, I'm planning on trying FishMama's instant oatmeal packets. I've got the powdered milk and everything, just need to put it together. I'm thinking I need to get some dried fruit though to add to the packets.